I was downtown last week to check out the vegan bakery Boots on (approximately) Main & Division and was pleasantly surprised. While waiting in line for my vegan chocolate cupcakes for Valentine’s Day I felt like I’d been picked up and plunked down in Portlandia! I love Portlandia … it makes me miss Portland even more though. I turned to the woman behind me and said as much. Her reply? “You are in Portlandia.” She said she was a transplant here due to her husband’s job move. And since I was right across the street, I popped over to Roost to check out their inventory. 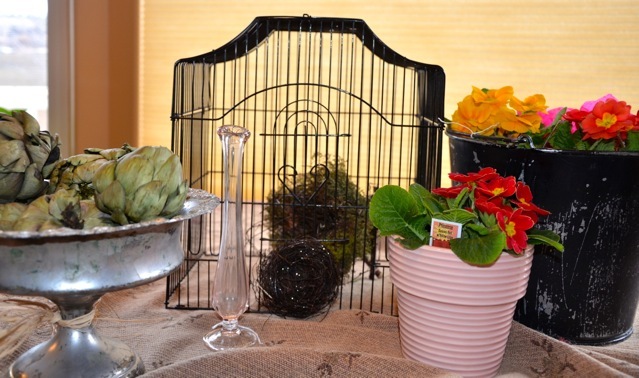 Pleasantly surprised was I, when I found a darling little, pink ceramic flower pot, a bird cage top, shabby black bucket, pink bud vase and a couple of nests. We’ll be using lots of nests etc. for Lola’s Girls birds in upcoming shows. Here’s a quick photo of my treasures. Oh and the candy dish on the left is one I bought there a couple weeks ago and filled with Pottery Barn’s artichokes. Don’t forget to check out our Facebook page for Lola’s Girls! !